New Zealand is a country of rare seismic beauty: glacial mountains, fast-flowing rivers, deep, clear lakes, hissing geysers and boiling mud. There are also abundant native forests, long, deserted beaches and a variety of fauna, such as the kiwi, endemic to its shores. Traditionally, New Zealand’s economy was built upon on a narrow range of primary products, such as wool, meat and dairy products. Over the past 20 years the government has transformed New Zealand from an agrarian economy dependent on concessionary British market access to a more industrialized, free market economy that can compete globally. This dynamic growth has boosted real incomes (but left behind many at the bottom of the ladder), broadened and deepened the technological capabilities of the industrial sector, and contained inflationary pressures. Per capita income has risen for eight consecutive years and reached $26,000 in 2006 in purchasing power parity terms. Consumer and government spending have driven growth in recent years, and exports picked up in 2006 after struggling for several years. Thus far the economy has been resilient, and the Labor Government promises that expenditures on health, education, and pensions will increase proportionately to output. 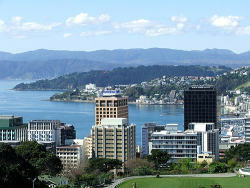 New Zealand comprises two main islands (called the North and South Islands) and a number of smaller islands. The South Island is the largest land mass of New Zealand, and is divided along its length by the Southern Alps, the highest peak of which is Mount Cook at 3754 meters. The North Island is less mountainous than the South, but is marked by volcanism. The tallest North Island mountain, Mount Ruapehu (2797 m), is an active cone volcano. The climate throughout the country is mild and temperate, mainly, with temperatures rarely falling below 0°C or rising above 30°C in populated areas but conditions vary sharply across regions. Contemporary New Zealand has a diverse culture with influences from English, Scottish, Irish, American, Australian and Māori cultures, along with those of other European cultures. Cultural links between New Zealand and the United Kingdom are maintained by a common language and sustained migration from the United Kingdom. Māori culture has undergone considerable change since the arrival of Europeans; in particular the introduction of Christianity in the early 19th century brought about fundamental change in everyday life. Use of the Māori language as a living, community language remained only in a few remote areas in the post-war years, but is currently undergoing a renaissance, thanks in part to Māori language immersion schools and a Māori Television channel. New Zealand has recently moved towards a system where school levels are identified by the year number. The years are numbered from 1 to 13. Primary school goes up to year 6, intermediate school finishes at year 8 and secondary school is the remaining five years of schooling. Most schools cater for either primary, intermediate or secondary school students: Years 1–6: Primary School (Ages 5–11), Years 7–8: Intermediate School (Ages 11–13), and Years 9–13: Secondary School (Ages 13–18). The name ‘college of education’ is protected by Act of Parliament — previously the name ‘teachers’ college’ was protected. Only universities and standalone colleges of education may use this title. Thus, privately owned institutions (which are not listed in Acts) providing teacher education such as the Bethlehem Institute (Tauranga) must use alternative names. For Universities: typically, a bachelor’s degree will take three years, and a further year of study will lead to an Honours degree. Not every degree follows this 3+1 pattern: there are some four year degrees (which may or may not be awarded with Honours), and some specialist bachelor’s degrees which take longer to complete. Typically, Honours may be awarded with first class, upper second class, lower second class or third class, but this can vary from degree to degree. A bachelor’s degree may be followed by a Master’s degree. A candidate who does not hold an Honours degree may be awarded a Master’s degree with honours: such a degree usually involves two years study, compared to one year for a Master’s degree for a candidate who does have an Honours degree. A candidate who has either a Master’s degree or a bachelor’s degree with Honours may proceed to a doctoral degree. Entry to most universities is “open”, that is to say that one only needs to meet the minimum requirements in the school-leaving examinations (be it NCEA or Bursary). A greater number of courses at NZ universities now have selective admissions, with the University of Auckland offering a large number of selective-entry courses. Mature students usually do not need to meet the academic criteria demanded of students who enter directly from secondary school. Domestic students will pay fees subsidies by the Government, and the student-paid portion of the fee can be loaned from the Government under the Government’s Student Loan Scheme. Weekly stipends can be drawn from the loan for living expenses, or the student can apply for a needs based (on assessment of parental income) “Student Allowance”, which does not need to be paid back. “Bonded Merit Scholarships” are also provided by the Government to cover the student-paid portion of fees, however, receipt of the Scholarship requires the recipient to stay in New Zealand for a certain time after graduation. The New Zealand Scholarship and the New Zealand University Bursary are awarded to school leavers by a competitive examination and also provide financial support to school-leavers pursuing a university degree but do not entail any requirement to stay in the country after they finish university. International students pay full (non-subsidised) fees and are not eligible for Government financial assistance. Until 1961 there was only one degree-granting university in New Zealand, the University of New Zealand which had constituent colleges around New Zealand. Now the colleges are independent universities in their own right, and since then two new universities have been created (Auckland University of Technology and Waikato University).